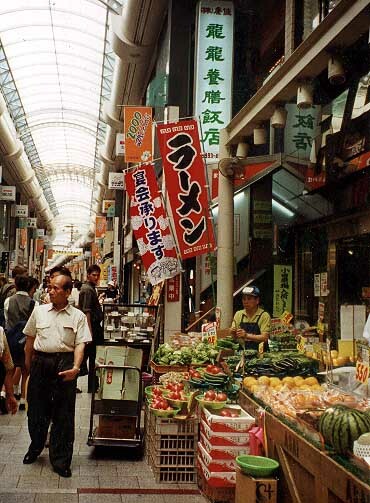 Fruit and vegetable stand, ramen restaurant and other shops in Tokyo. Market, fruit, watermelon, oranges, pears, ginger root, vegetables, tomatoes, eggplant, ramen, restaurant, shops, sell, buy, eat, expensive, cheap, delicious, bad-tasting, bustling. Shopping, food, ordering in a restaurant, asking what things are, clothing. Forming questions and making requests, stating preferences.